the dark shark teeth are from the extinct Cosmopolitodus hastalis shark that lived in the Miocene. The light shark teeth are from the extinct Othodus shark who lived in the Eocene. Most of these shark teeth are from the extinct Cosmopolitodus hastalis shark that lived in the Miocene. The C. hastalis shark was around 10 meters long and populated the seas between 3.5 to 23 million years ago. These Shark teeth are found in, the now closed, port area of Antwerp. beautiful specimens for the collection or in the classroom. 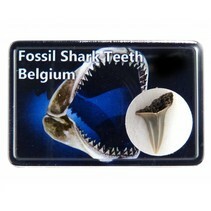 You will also find a number of shark teeth from Morocco on this page. Sharks live already for a long time on the earth. The oldest fossils that are found date from around 450 million years ago. The shark is a predator that occurs in different sizes and shapes. Our seas are still richly filled with sharks. That makes this preditor one of the most successful species on earth.